The SWS invites all its members to contribute articles of interest on welding technology. The articles may be on any aspect of welding technology, eg. new procedures, products or new developments. They can be narration of personnel experience on a difficult problem in welding. SWS had received permit from the Publication Department, Licensing & Registration Section to print published / sell and distribution of the SWS Newsletter, this application includes advertising as originally applied. 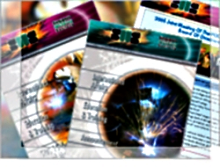 Singapore Welding Society Newsletter is distributed quarterly to 600 overseas and local members as well as non-member interest groups. The newsletter reaches Reciprocal Societies worldwide, including Societies in Australia, Malaysia, Indonesia, Brunei, UK, Japan, Korea, Taiwan, Germany, China, Philippine, Hungary, India, Thailand, France and the United States. Price quoted in Singapore Dollar and open to all SWS Corporate Members only. Please contact SWS Administrator at (65) 6779 7706 / secretariat@sws.org.sg should you require further assistance.